“There’s something happening here; what it is ain’t exactly clear” are the opening lyrics to the Buffalo Springfield 60’s anti-war song. While protest is not our focus, something indeed is happening with today’s workforce and economy and town and city managers are being challenged to both make sense of it and address it. Local government is changing, our workforce is different, and citizens and elected officials have high expectations for results. While there are many challenges facing town managers, workforce issues rise to the top. The Center for State & Local Government Excellence survey “State and Local Government Workforce: 2014 Trends” found that the majority of public sector managers cited their “top concerns are recruiting and retaining qualified personnel, staff development, succession planning, employee morale, competitive compensation packages, public perception of government workers, reducing employee health care costs and dealing with employee workload challenges.” Like a freight train screaming down the tracks, today’s manager must tackle these issues. Aging workforce: the International City/County Management Association (ICMA) reported in their 2012 State of the Profession survey that 63% of municipal employees were 51 or older with nearly 24% 61 or older. A Black & Veatch’s strategic direction survey reported an aging workforce is among the top ten issues affecting the water industry. A 2013 Center for Energy Workforce Development (CEWD) survey report that 62% of electric utility workers have the potential to retire or leave the workplace by 2020. Whether it is police, fire, librarians, or wastewater operators, aging baby boomers are beginning to exit the workplace in what some are calling the “silver tsunami” and the public sector, as a whole is ill prepared for the exodus. And to make matters worse, fewer young people are entering the profession. Volunteers are not joining the fire departments; electric engineers are choosing high tech over public power; and environmental professionals prefer consulting to wastewater treatment. Creating a performance based culture: The municipal, union mentality culture must end. Communities can no longer afford bloated workforces, crippling work rules, huge unfunded pensions, and pay plans based on length of service rather than performance. Today’s workplace culture must reward performance and productivity and encourage employee engagement resulting in worker retention and attracting the best external talent available. Union work rules that hamper operations must be replaced with those that support flexibility, and pay must be based on merit and include performance incentives. In addition, town managers should emphasize priorities and goal setting, measuring and monitoring performance and not just effort and activity. Employees must be flexible, customer centric, and engaged. Managing a multidimensional and changing workforce: Today’s workforce is changing and different. As boomers age out, we are seeing a different look than we have come to expect. Whether at town hall, public works, the water or fire department, we now find more women, individuals of color and youth. As the workforce becomes more diverse, managers must have the skills to lead this “different” workplace. Engaging a younger generation, with workers who have a different perspective and have distinct expectations of their boss and work, unlike other generations, will require significant adjustments, patience, tolerance and the skills to manage. Recruitment, retention and rewards: There is a new “3 R’s.” Finding individuals who want to work in public safety, public power, wastewater and any other aspect of local government have never been harder. Managers will have to find ways to make government careers more attractive to a younger generation, while competing with the private sector that may have deeper pockets and have shiner toys to dangle. Work/life balance, flexibility, career development and telecommuting will be needed to attract this new generation of worker. And to retain them, communities will have to reward workers with cash (merit pay, incentives, benefits) and non-cash (opportunities, training, titles). The lure of a job in government has faded. Competitive pay has become a minimum threshold to attract and retain talent. Money talks. A strategic approach to managing: Managers and elected officials must now make decisions about the direction of their business utilizing a strategic framework. No longer can they simply move from crisis to crisis, election to election. A big picture, business approach to government will be needed, discarding “how we’ve always done it this way” approach to a reinvention of government that addresses today and tomorrow’s realities. There will be a greater reliance on technology, creativity, innovation, best practices and benchmarking, and these require a new kind of leader to manage a new kind of workforce that can thrive in this new world. In the past, public utilities were lead by engineers, electrical engineers in power, environment engineers in water and wastewater. No longer. Today the need is likely for an MBA or MPA. Towns and their utilities are multimillion-dollar businesses and require a strong businessperson to run them. It is not a place for on-the-job training. Develop a strong workforce that is energized, embraces change, is resident centric and strives for excellence. Create a workplace culture that sheds the municipal stereotypes of entitlement, bureaucracy and coldness with one that is productive, effective and efficient to one that is customer focused, friendly and helpful. Town hall must always be welcoming. Think long range and not just about today’s firefight. Managers and elected officials must understand the big picture and not just how it will affect this year’s budget. Maximum impact must be part of the new lexicon and that means taking a strategic approach to governing. Become a learning environment. Continuous education for all staff, elected officials and citizens are essential. Exposure to new and different ideas stimulates new thinking, creativity and innovation, challenging and questioning the previously accepted norms. Be passionate about government. Leading a municipality is a worthy profession. Show energy. Get excited. It’s contagious and it is essential in recruiting and retaining star performers; motivating staff; and engaging residents and ratepayers. But most importantly, it is crucial in moving people forward, persuading them and getting them to follow. The challenges of the 21st century will be great. Managers and elected officials will have to discard old notions and embrace new thinking. Continuous change and experimentation will be the norm. Town halls must be incubators of management best practices. There indeed is something happening here and that’s a good thing. Aging workforce: We’re getting older. Baby boomers are beginning to exit the workplace in what some are calling the “silver tsunami” leaving both employment spots to fill and huge gaps in knowledge to replace. Most employers are ill prepared. Recommendation: Put in place succession plans which address replacements, skills gaps, and prepares the organization for an orderly transition of talent. Creating a performance based culture: Today’s workplace culture must reward performance and productivity and foster employee engagement resulting in worker retention and attracting the best external talent. Work rules that hamper productivity must be replaced with those that support flexibility and pay should be merit based and include performance incentives. There also must be an increased emphasis on setting priorities and goals, measuring productivity and monitoring performance. And your employees must be agile, customer centric, and willing to do whatever it takes for the organization. Recommendation: Put in place training programs to prepare both supervisors and employees. Add communication initiatives to demonstrate the need for and benefits of these required changes. Recruit only employees who can thrive in a changing environment. Managing a multidimensional and changing workforce: Today’s workforce is changing and different. As boomers age out, we are seeing a different look in the workplace then we have come to expect in the past. As the workforce becomes more diverse, managers must have the skills to lead this workplace. Engaging a younger generation, who will work along side older individuals who have different views and expectations of both their boss and work, will require significant adjustments, patience, tolerance and clear understanding. Recommendation: Multicultural, mutigenerational training should become a part of your training curriculum. Employee engagement/satisfaction surveys should be conducted annually. Recruitment, retention and rewarding: There is a new “3 R’s.” Work/life balance, flexibility, career development and telecommuting will be needed in order to attract and retain this new generation of worker. And to retain them, you will have to reward workers with cash (merit pay, incentives, benefits) and non-cash (opportunities, training, titles). Recommendation: Recruitment and retention programs should be put in place that include development of a recruitment brand and tool box; compensation market surveys should be conducted; and turnover analysis should be put in place. A strategic approach to managing: Managers must make decisions about the direction of their business utilizing a strategic framework. No longer can they simply move from crisis to crisis. A big picture, business approach will be needed, discarding “how we’ve always done it” approach and re-inventing your business to address today’s and tomorrow’s realities. There will be a greater reliance on technology, creativity, innovation, and best practices and benchmarking and these require a new kind of leader to manage a workforce that can thrive in this new world along with a workforce that can blossom amongst rapid change and have the skills to learn and adapt. Recommendation: Strategic plans should be updated to reflect the changing workforce and market place. In 2016 and beyond we all must begin to think differently, have the skills to look around corners, while making bold decisions in addressing this changing workplace. Three critical trends are emerging in today’s workplace: 1) the traditional full-time, 40 hour worker is being replaced by part-timers, Independent Contractors and gig-workers; 2) the ability to attract and retain workers is going to require different strategies and those employed in the past; and 3) workforce loyalty has a new look. 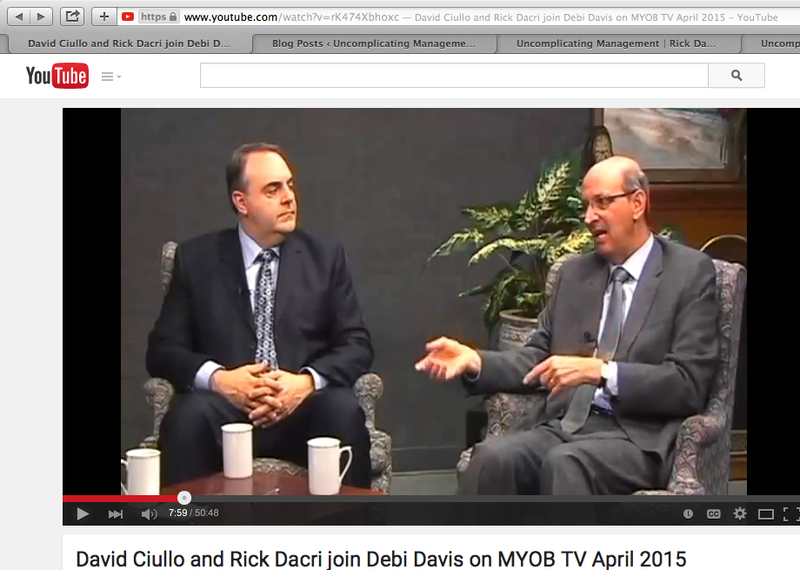 Rick Dacri & David Ciullo discuss these trends and how employers should respond in this Mind Your Own Business TV interview with Debi Davis. To view the interview, click Workforce Trends. Post by Rick Dacri, August 18, 2015. The job of the town manager or an elected official is not easy. But, when things are operating well, people are working cohesively, residents are happy, and results are being achieved, then it’s good to be in local government. Results begin when three elements are in place: a positive working relationship between the board and the manager, a shared mission about what the town wants to accomplish, and a commitment to move forward together. The relationship ensures that a collegial rapport occurs based on trust and shared values. The mission guides the town’s allocation of limited resources: money, talent and time. And commitment pulls everything together. Absent any of those components, everything collapses like a two-legged stool. That collapse often occurs when priorities become unclear, the manager becomes unsure where the board is headed, or individuals are moving in different directions. Therefore, a comprehensive or strategic plan is necessary to provide focus to both the board and manager. The key is to get the manager and the board members on the same page. So how do you forge an effective relationship while meeting the town’s mission? Set clear expectations and accountability standards: After all, if you want the manager to drive the organization where you want, develop a map. Be clear, specific and direct. Understand your manager’s needs and expectations: Boards need to take time to get to know what makes their manager tick. Know the individual’s personal and professional goals, objectives and stressors and what can you do to help alleviate them. Provide a timely performance review and know the market for executive compensation: Late reviews and salaries that fall below their peers are two areas that cause the greatest resentment, resulting in breakdowns in the relations and turnover. In a market with a shortage of good municipal management talent, this can be a catastrophe. Set realistic performance goals: the strategic direction of the town will only be achieved when this is done well. The genesis of all goals should be the town’s strategic plan. Provide ongoing feedback on performance: It’s lonely at the top. The manager needs input from the board. An ongoing dialogue is essential. Support the manager’s development: Grow your manager. The world is constantly changing and your manager must be able to keep up. A stagnant manager with last year’s ideas is not going to move your organization forward. There is a fundamental, almost systemic tension between the roles of the board of selectmen and the town manager. Who is in charge? Absent clear guidelines and a process to address roles, responsibilities, and strategic direction, conflict arises. Struggles for power and control emerge. As with any conflict, the solution is to get people talking and listening. Regardless, embracing the collective belief in the mission of your town is a powerful magnet to draw people together, allowing them to rise above ideology and personal agendas for the collective good of the town. A strong commitment to this belief and a passion to make it work allows most to make the relationship piece work. It happens everyday in well run communities. Establish a clear, mutually agreed upon mission for the town and define values from which to operate. Take the time to discuss vision, strategy and policy. If your focus is simply surviving today, you’ll likely stagnate. Effective boards understand the importance of strategic planning as a means to steer the organization. Identify clear, annual goals and needs along with a time frame to complete. Develop a vision for your community. Dream big and move forward, one step at a time. Establishment a clear division of responsibilities and accountabilities for the board and manager. Be specific about boundaries and control. Governance must be clearly delineated and understood. You can only have one town manager at a time. Establish a forum for ongoing open communications and planning. Build open discussions into your calendar. Set up formal times to meet, both formally and informally with the manager to maintain focus and to nurture the relationship. Establish methods to resolve conflict in a respectful, open and honest manner. Conflict will occur. Set up a process to address it, and, if that doesn’t work, bring in outside professional help. Establish priorities with the understanding that they must be reviewed on an ongoing basis since the town’s challenges are ever changing. We live in a rapidly evolving environment. The board and manager must be nimble. The strategic planning process helps to anticipate the expected challenges, threats and opportunities before they emerge, but external and internal changes can occur that will change the picture. Develop methods to establish trust and support, where everyone adheres to the plan and each of you “has each other’s back.” Trust is a critical element in any healthy relationship. Without it, things fail. Work to continuously build trust and get help when repair is required. Develop and implement an effective annual performance evaluation system that is an ongoing process. There should be no surprises in annual evaluation if communication has been healthy, ongoing and honest. No business relationship can occur without clear accountability standards. A performance evaluation can be an excellent tool for this. Establish a formal process. Provide each board member an opportunity to contribute. Focus on the future and avoid creating a “report card” system. And encourage informal feedback throughout the year. Develop a process to bring newly elected board members up-to-date on what has been established and agreed upon amongst the current board and manager. Board orientations bring new members up to speed quickly, allowing them to make an immediate contribution. Create a board of selectmen self-assessment. This is a tool designed to help clarify roles and responsibilities, assess board performance, seek ways to improve and plan for the future. Outside professionals are often engaged to help boards develop such a mechanism. Last year I introduced the Accelerated Supervisory Development Program. I conducted two programs and 24 individuals signed up and successfully completed it. Since then I have been asked when I was going to offer the program again. Well, mark your calendars. A new program is scheduled to begin on May 13, 2015. The program includes 5 regularly scheduled training sessions, one-on-one coaching with me, training materials, my book, and more. Interested? Follow this link and read all about it and register. With a starting date of May 13, this program is the perfect way to develop the skills and effectiveness of your management team! To learn more or to enroll, click Accelerated Supervisory Development Program or call me, Rick Dacri at 207-229-5954 or email me ar rick@dacri.com. Enrollment is limited, so sign up now.